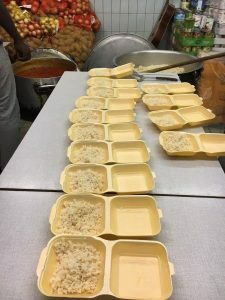 The Belgian kitchen is a fantastic organisation that we first began working with in the old Calais ‘Jungle’ where they provided over 1,000 hot cooked meals every day. They now operate out of a large disused building in Brussels where over 25 refugee families are hosted, and hot cooked meals continue to be provided for hundreds of refugees sleeping rough in the town centres. The refugees themselves join in the preparation of the food and maintenance of the building, and Care4calais provides food supplies whenever we are able to.